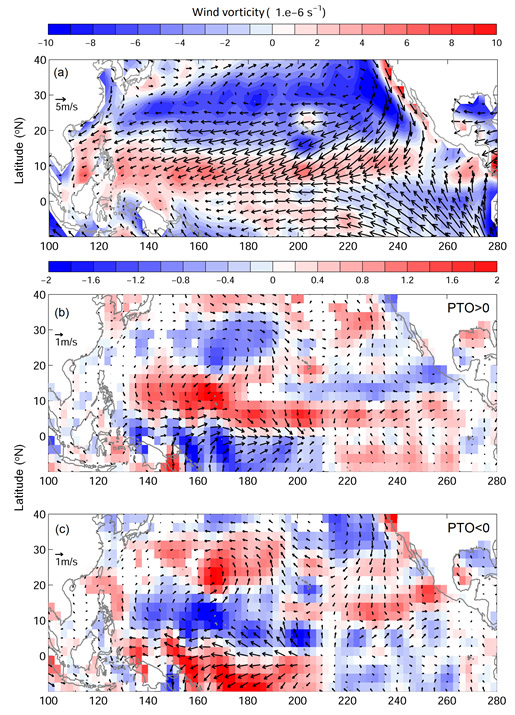 A group of researchers led by Dr. Yu-Lin Chang from the Application Laboratory of Japan Agency for Marine-Earth Science and Technology (JAMSTEC) analyzed a combination of observed and reanalyzed atmospheric and oceanic data, demonstrating that the distribution of tropical cyclone formation is influenced by the Philippines−Taiwan Oscillation (PTO). The PTO involves a north-south oscillation in wind patterns off the Philippines and Taiwan inter-annually, which happens to be the tropical cyclone formation region in the Western Pacific Ocean. The relation was found between the differences in horizontal wind vorticity (PTO index*1) and the occurrence of tropical cyclone formation in the same area between years 1979 and 2014. The results showed that when the PTO index is positive (i.e. when the trade wind weakens, the wind off the Philippines strengthens in an anticlockwise direction and the wind off Taiwan strengthens in a clockwise direction), tropical cyclones form more frequently south of 18°N. Conversely, when the PTO index is negative (i.e. when the anticlockwise wind off the Philippines and the clockwise wind off Taiwan both weaken), tropical cyclones form more frequently north of 18°N. Furthermore, when the PTO index is positive, the number of tropical cyclones that approach Japan increases. Annual variations in the formation of tropical cyclones in the Western Pacific Ocean were often linked to the large-scale climatic fluctuations, such as El Niño. This study showed that local climatic processes (i.e. wind patterns off the Philippines−Taiwan) might better explain the occurrence of tropical cyclones in that region. Overall, these findings suggest a new direction in climate change research: large-scale climatic fluctuations affecting the entire Pacific Ocean (e.g. El Niño, El Niño Modoki) and discrete phenomena (e.g. tropical cyclones in the western North Pacific Ocean) are connected via local climatic fluctuations, such as the PTO. Consequently, if ocean-atmosphere coupled seasonal forecast models implemented by establishments such as JAMSTEC’s Application Laboratory can reliably predict El Niño Modoki, it will also be possible to forecast the PTO. The possibilities of seasonal forecast applications will hence expand. In this context, the scientists will continue further research toward comprehensive prediction of seasonal climatic fluctuations by utilizing ocean-atmosphere coupled models. The above results were published in Scientific Reports on November 29, 2018 (JST). Figure 1. Oceanic wind patterns (1,000 mb isobaric surface). Arrows indicate wind direction and strength, color shading indicates horizontal wind vorticity, and blank areas represent statistically non-significant values. (a) Mean values between years 1979 and 2014, (b) anomalies (deviations from the mean) when PTO was positive, (c) anomalies when PTO was negative. Figure 2. The left panels show the tropical cyclones forming locations in case of (a) positive PTO and (b) negative PTO; numbers inside brackets indicate the total number of tropical cyclones that occurred respectively in four geographical sectors: north/south of 18°N, and west/east of 140°E. 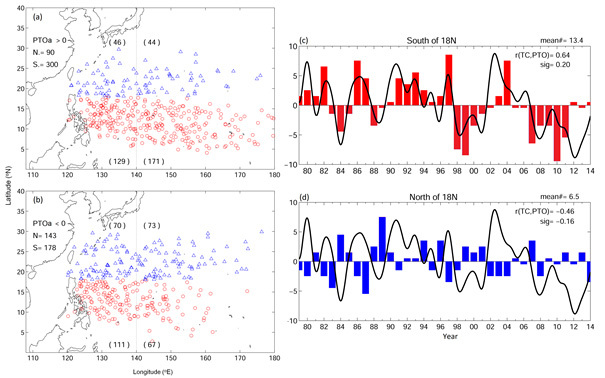 The right panels show two annual time series of tropical cyclones anomalies (c) south of 18°N (13.4/year) and (d) north of 18°N (6.5/year). In all panels, the red (blue) color indicates locations south (north) of 18°N.